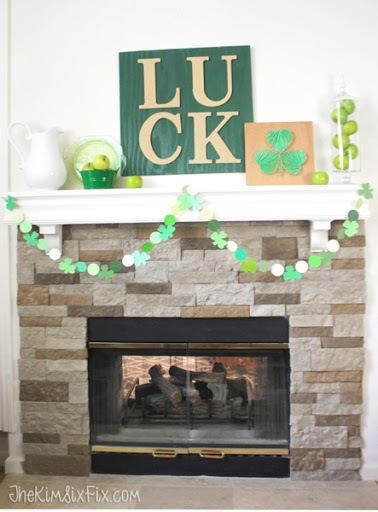 I have finally got my St. Patrick’s day mantel up and can’t wait to share it with you. Even though it isn’t a big holiday, it is fun to see what I can come up with every year and this year was no exception. The other is this new large LUCK word art piece. I decided to play off the gold nails in the string art, so I spray painted the letter with Gold Glitter spray paint from Rustoleum. In the interest of time (and laziness) I also spay painted the board kelly green, but regular paint probably would have been better. I really like the dark green color align with the brighter more yellow greens. I reused my paint chip swag I made a couple years ago..
Wishing you a FABULOUS St. Patrick’s Day!